We are now offering a Monthly PR Retainer service. Don’t have your own promo department or dedicated PR person or you just want to expand that area, then look no further, It’s a Promo Thing can look after your music PR needs & become you personal PR & plugging department. Instead of buying promo campaigns in bulk this is the perfect way to spread your costs to monthly payments and get the results that are needed. We grow with you, we work together on strategies, advise and selected which tracks to promote where. Even though we will send out your music to our promo systems as normal we will take care in hand selecting which mixes the DJs will receive the music direct & personally via email with personalised links per campaign and only deliver to the DJs of that musical choice per campaign, to maximise your music release. Minimum of 4, 6 or 12 month retainer terms agreed of the above priced monthly services. Initial fee due upfront and then each fee per month before the service continues on the recurring months. If you default or cancel a service then half the remaining fee is payable as way of a cancellation fee as standard. Choose from 4 different levels below. 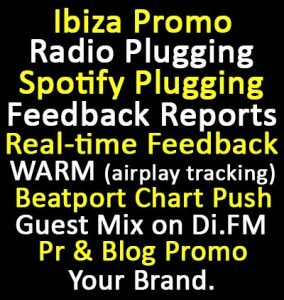 – Ibiza Promo – Hand delivered (when possible) and personally email plugged to the resident DJs & radio around the Island. – Radio Plugging (via personal email plugging) – Lower plugging fee/bonus’s for placement then our dedicated plugging services. – Feedback reports per campaign. – Push direct to beatport for your chart to be considered to be featured. – 1 hour guest mix on DI.FM. – The promo send out page is designed & branded to your label/artist’s branding. – PR & Blog Campaign – Press release written (If Required). – Spotify Promotion (3 tracks form all promo campaigns only – not all tracks.). *This is the total amount of promos you can send per month with this level but if you use less the monthly total then the unused promo campaigns do not pass over to the following month i.e. If you have opted for 2 promo campaigns a month and you only use 1 the the other promo campaign does not role over and your promo campaign count rests to 2 for the following months. But we do keep pushing tracks across the months not solely on one month i.e. If you promo a track in January we will still push for opportunities in February for that same release if the opportunity arises. **Historical data not available, as of yet, only real-time airplay monitoring.